Hi everyone! I decided to add a Youtube channel to my blog. You can find my channel at www.youtube.com/channel/UCAOTP93U7WmY6XBF5DLCj_w. I’ll be back tomorrow with my third edition of the mailbag, and hopefully a new video! Kingstowne Chess Festival Next Week! Well, after a long wait, next week I’ll be playing in my first long time control tournament at the Virginia Closed. Last month in the State Championships, I finished 7th with a score of 4/6, with only one loss to Grandmaster Sergey Erenburg in what was one of my best performances of the past year. Next week, I’ll only have four rounds to try to keep up the solid play at the Kingtowne Chess Festival. Last year I scored 1.5/4, but was a significant underdog in all my matches, so this year I aim to double that with a score of 3/4 or better. Its a bit ambitious, but I’ve done the work, and hopefully pulling my Tactics Trainer rating on chess.com to 2100+ will pay off. As you may remember, I occasionally post a profile of famous Grandmasters, both retired and current. So far, I’ve shown games from Paul Morphy and Fabiano Caruana, and today, I will add Mikhail Tal to that list. If you consider yourself a tactical guru and enjoy this post, I highly suggest the book The Magic Tactics of Mikhail Tal by Karsten Müller for quality tactics from the Soviet Grandmaster. 9.O-O-O White’s intentions are clear. In a true Yugoslav style, Tal will push his pawns on the g- and h-files. Black must find counter play quickly on the queenside in this race position. 11…h6? Black will now find it much harder to castle with white’s pressure on h6. Furthermore, by making this move, Black loses a tempo to expand on the queenside. 13…Ne5?! Not the greatest move, Black has yet to improve his position or get his king safe. Now Tal will go for the king. 17.Nxd1!! The only winning option. By attacking the queen via discovery, White gets the critical tempo he needs to win. Tal was able to win this game because his opponent made two mistakes: 11…h6 and 13…Ne5. When the opponent plays passively or creates weaknesses, you must challenge them! This next game I want to show Tal played when he was only 13 years old! Still we see the same attacking style and charismatic play from the future World Chess Champion as he wins in a short 16 moves! 13.Bg5 The most principled move. This causes Black a lot of trouble as the queen must always monitor f6. 13…Bc7? This move invites Tal’s response. Black is much worse here, but perhaps 13…Bxf5 is worth a shot? 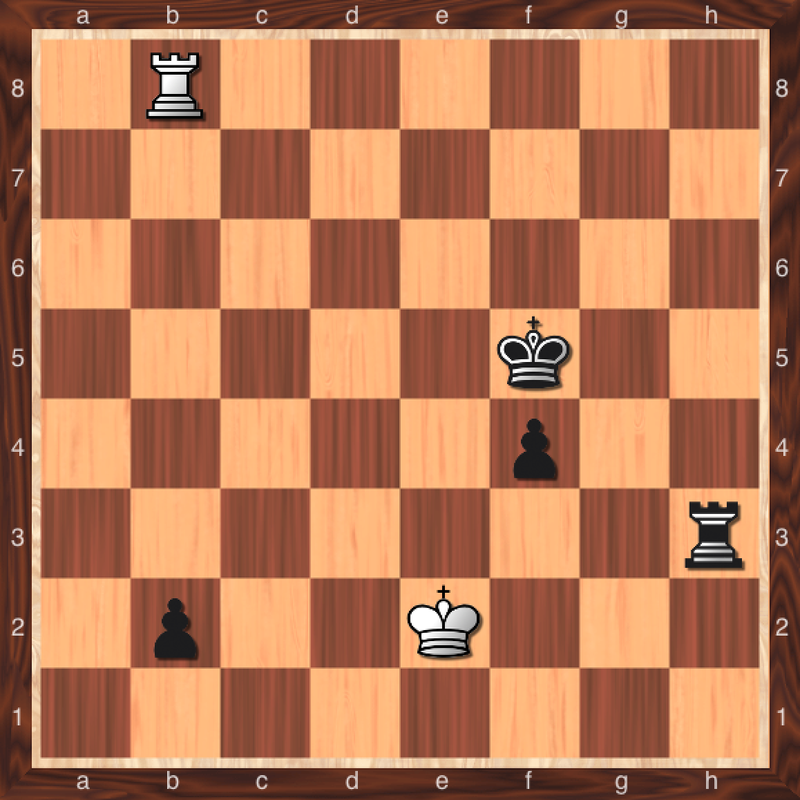 By trading down pieces, Black reduces some pressure in the position. 14.Rd1 Perhaps 14. 0-0-0 is better, but the idea is still the same. Get the rook on the open file. In this game, Tal was much better after 10…e5?! as he used the critical move 11. Qe2 to gain the initiative. Black was never really able to challenge Tal after that because he pieces were undeveloped. Even in the last position, Black still has a rook on a8 and a bishop on c8 being block by a knight on d7. This last game was a blitz match, but still shows Tal’s tactical skills with a critical kingside sacrifice against a Grandmaster well known for opening theory innovations, Roman Dzindzichashvili. 10.Re1 While White does not have a tangible advantage in this advantage, Tal’s mindset is to play aggressively, and gain an advantage due to Black’s blocked in Bishop on c8. If he can obtain an active position and Black fails to find a way to match him, Tal will surely win. 14…Bc6 A good and thematic idea from Dzindzi! This is a common way to solve the problem of the bishop on c8. While it may seem awkward on c6, the idea is synonymous with a fianchetto on b7. While Black loses the game, this move is a good thematic idea if you are a Sicilian player. 17.Rd3 With the idea of a rook lift to g3. White must act fast before Black gets too much counter play. 21.Qf3 Putting the queen on the same file as the king, but will it be in time? 22…a6 A tactical oversight, but since it is a Blitz game, its hard to speculate if Dzindzi saw this idea. Either way, this is a good pattern to know when attacking the kingside pawn structure and king. 24…Kh7 Not much here for Black. 24…Kxh6 or 24… Kh8 both lose immediately to 25. Nxf7+ +-. 24… Kg8 isn’t any better as 25. Qg3+ makes for an easy win. What can we takeaway from these 3 games? Take advantage of slow development with fast activation. Furthermore, in the first two games, the critical mistakes were both pawn moves. Pawns cannot move backwards, so its always critical to look at weak squares exposed after each pawn move. If you’re picking up a theme between my Grandmaster posts, active play wins games. Feel like I missed something? Feel free to comment below! If you read my blog last week, I introduced a new segment to my blog, Isaac’s Mailbag. Each week, I will answer 4 questions which I have been asked about chess. Without further ado, let’s get started! 1) What do you have against 1. e4 e5 for Black? This often comes up when I talk about openings. The problem I have with 1 e4 e5 for Black is that after 2 Nf3, there is not exactly a dynamic positional approach for Black. Against the Ruy Lopez, Black can try the g6 lines, but as seen in the Nakamura–Carlsen game of the Sinquefield Cup, Carlsen could not get an advantage after trading the light squared bishop. The Four Knights and Giucco Piano does not really offer too much variety, and the Two Knights Defense relies a lot on prior memorization. This doesn’t even account for the King’s Gambit, where White forces the game into tactical game early. My problem with 1… e5 is Black doesn’t control the kind of position as much as he can in a Sicilian, French, or even a Scandinavian. The same lines get boring after a while. 2) Chess season is starting, and I’m a chess mom who needs help coaching kids rated below 1400. What would you recommend? Many scholastic clubs are starting, but often times coaches don’t know where to start. Here is the ChessKid Curriculum. Many coaches use this for private lessons, and while it is kind of a cookie-cutter course, it does provide a framework to start with. 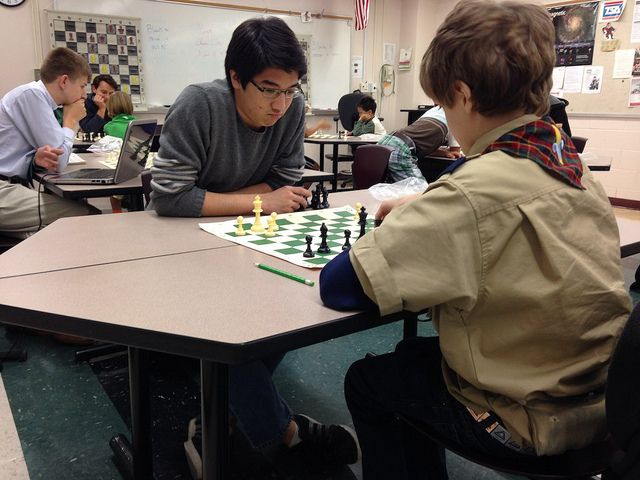 If you have a competitive middle school club, try getting a USCF Affiliate to play rated games. Rated games are the best way to practice, and will force your players to calculate. 3) What is the coolest tactic you’ve seen this week? Grandmaster Andrei Volokitin found this nice gem against Mushgev Asgarov in the 2014 Baku Chess Festival. 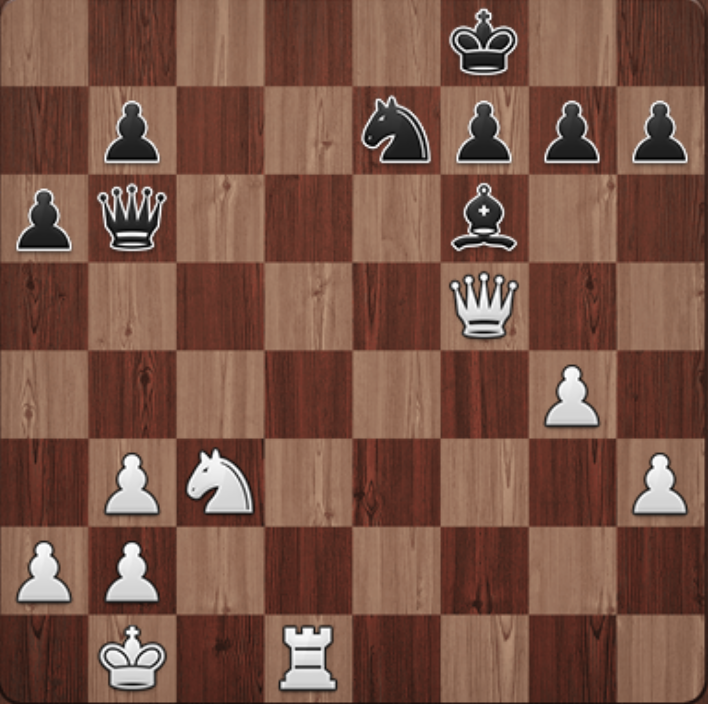 See if you can find Volokitin’s brilliancy before seeing the answer (position courtesy of chess24.com)! 1. Qc5!! and the game is over. If 1… Qxc5 2. Rd8#, and 1… Qc6 runs into 2. Rd8+ +- anyways. The knight cannot move as a result of the pin, so Black is totally lost. Good job Volokitin! 4) Who won the Bilbao Masters Last week? Former World Chess Champion Vishy Anand drew easily to Ruslan Ponomariov in Round 5 to guarantee a first place finish. The section featured a total of four players: Anand, Ponomariov, Levon Aronian, and Francisco Vallejo Pons. Feel free to leave your questions in the comments section if you want to have a question answered next week! Rook endings are tough, and you never know when gimmicks can save you a result. 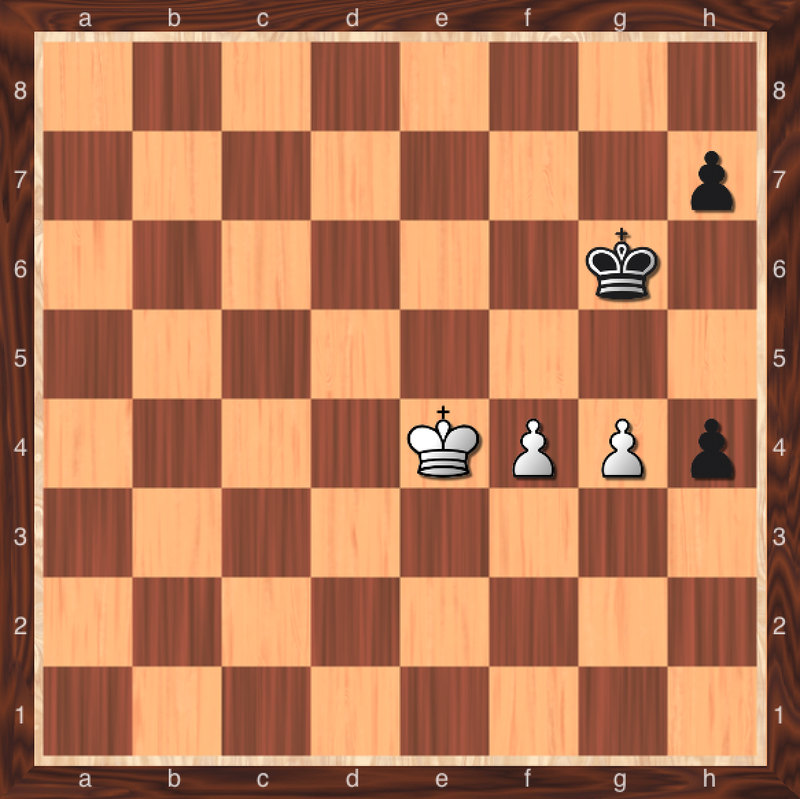 White to move – Is there a draw? Know this position! This is a key defensive mechanism when the opponent’s pawns are separated by several files. Rook Endings – Now Aren’t They Tricky? I played in a quad yesterday, scoring 2/3 and tied for first place. While I feel like I should have done better, I left the tournament with this little gem. My opponent had been fairly passive in the endgame, and now after 37… Re3, I can threaten 38…h5-h4, because after 39.g4 Rxh3 40. g5 Rg3 and I am up a pawn. And if White should trade 41. Rxg3 hxg3 42. g6 g2 41. g7 g1=Q -+. My opponent, not finding anything to do, played 38. g4?!. h3-h4 would have been a much better alternative. 38… Rxh3 39. g5 Rh5+ This check is critical for this line to work. 40. Kb5 Rg4 Now should White trade rooks, my king is in the pawn square, so I will win easily. 41. Rd7+ Kc7 42. Rd5?? Instantly loses the game. I found 42… a6+ 43. Kxa6 Kc6! and my opponent resigned. This move not only threatens the rook, but checkmate with Ra4+. White cannot stop the checkmate with 44.Ra5 obviously, so the rook is lost. For today’s post, I have 2 positions where a player uses a critical stalemating technique to preserve a half point. I highly recommend setting these up on a board a visualizing these variations. After all, these are the kind of skills that you will need to have developed in a real game! Before we delve into the variations, it is critical to recognize that with doubled h-pawns, White’s ability to win fully depends on Black’s quality of play. However, this means that it is White that is playing for a draw, while Black will challenge for the point. 1. h6 “Passed Pawns must be pushed!” Its a bit dogmatic, but White needs Black’s king to move away to have any shot of a result. 1… Kf8 2. h5 Covering the g6 square. Notice how the white pawns do a nice job of covering both g7 and g6. 2… Kf7 Black blocks any hope of entry for White’s king. This next move is critical for White. If you thought 3. Kf4 was correct, well check again after 3…f5 4. 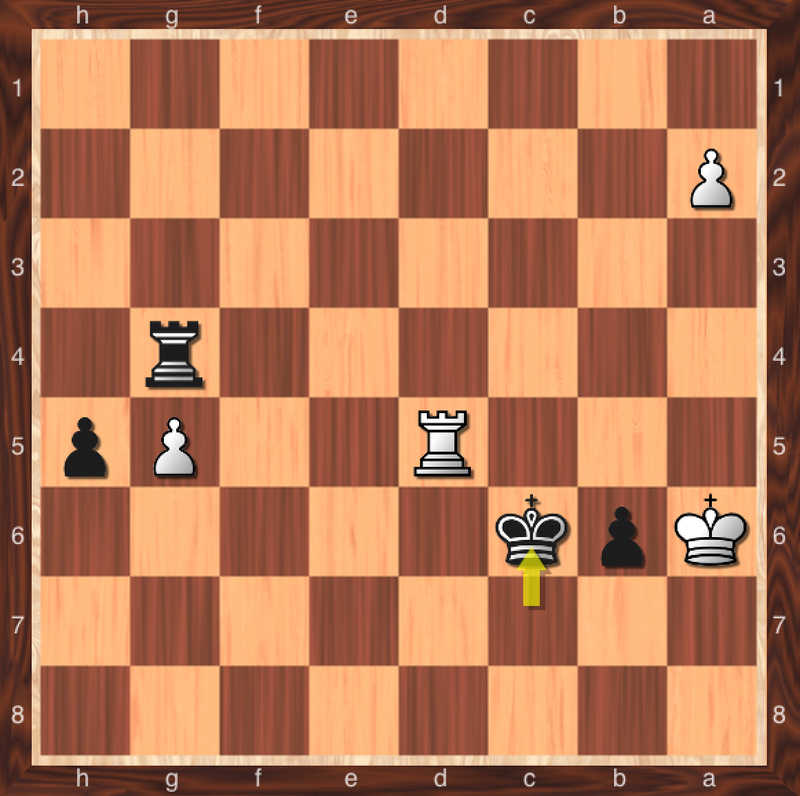 Kg3 Kg8 -+ Black has won the endgame, as White’s king is stuck on g3/f4. Black will snack on the h-pawns and rendezvous with his passed pawns for the win. If you saw the only other option, 3. Ke3! Kudos to you. Let’s start with one of two responses for Black. 3… f5 Not the best move, but must be calculated. 4. Kf4 Kf6 5. Kg3= or 4… Kg8 5. Kxf5! g3 6.Kg6 g2 7. h7+ Kh8 8. Kh6= The key technique. Any major piece promotion results in stalemate, and a minor piece promotion is insufficient for Black to checkmate. 3…Kf8 is more challenging but still equal using the same technique in the variation before. 4. Kf4 f5 5. Kxf5! g3 6.Kf6 Kg8 (not 6…g2?? 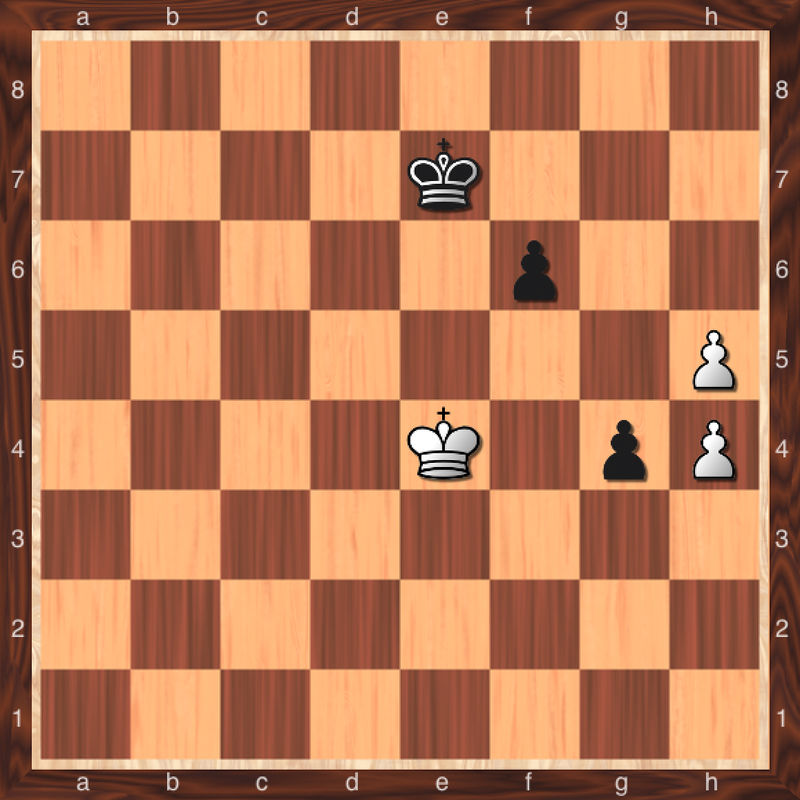 7. h7 g1=Q 8.h8=Q+ Qg8 and now White has to find 9. Qh6+ Ke8 10. Qe3+ Kd8 11. Qe7+ Kc8 12.Qe6+ to win.) 7. Kg6 g2 8.h7+ Kh8 9. Kh6= and the same position from before has arisen. 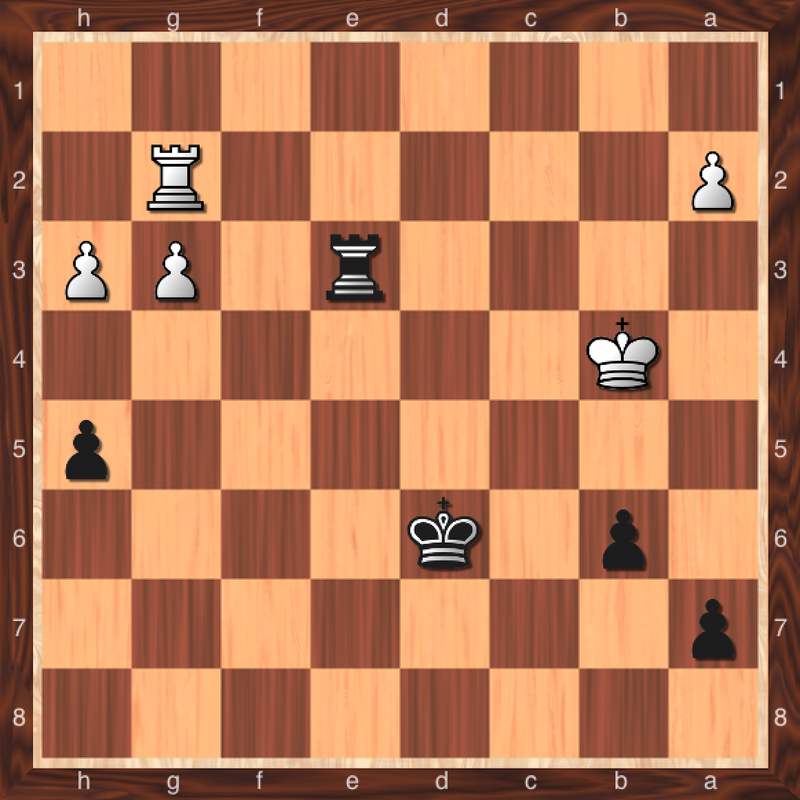 Now that you have seen this concept, let’s see if you can apply it for Black in this game from 2001 (Lont–van der Heijen)! 1…. h5 An easy move to find. A trade guarantees a draw. For example 2. gxh5+ Kh6 3. Kf3 Kxh5 4. f5 Kg5 5. f6 Kxf6 6. Kg4= 2.g5 h3 3.Kf3 h4 Same idea as before. Create a wall so the White king need more tempi to attack the pawns. 4.Kf2 Kf5 5.Kf1 Again, like before, 5. Kf3 Kg6= only draws. 5…Kxf4 6.g6 Kf3 7.Kg1 Kg3 8.g7 h2+ 9.Kh1 Kh3= And the draw is achieved. This is a good idea to have in your endgame arsenal in tournaments. You never know, this could save you a half point!